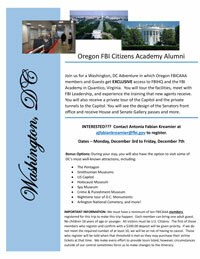 Join us for a Washington, DC Adventure in which Oregon FBICAAA members and Guests get EXCLUSIVE access to FBIHQ and the FBI Academy in Quantico, Virginia. You will tour the facilities, meet with FBI Leadership, and experience the training that new agents receive. 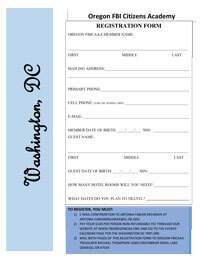 You will also receive a private tour of the Capitol and the private tunnels to the Capitol. You will see the design of the Senators front office and receive House and Senate Gallery passes and more. Arlington National Cemetery, and more! IMPORTANT INFORMATION: We must have a minimum of ten FBICAAA members registered for this trip to make this trip happen. Each member can bring one adult guest. No children 18 years of age or younger. All visitors must be U.S. Citizens. The first of those members who register and confirm with a $100.00 non-refundable registration fee will be given priority. If we do not meet the required number of at least 10, we will be at risk of having to cancel and your registration fee will be returned less any service processing fee charges. Those who register will be told when that threshold is met so they may purchase their airline tickets at that time. We make every effort to provide tours listed, however, circumstances outside of our control sometimes force us to make changes to the itinerary. A nonprofit organization separate and apart from the FBI.